Something of a unexpected twist for the blog with this post, straying as it does into the realms of literature. I noticed in the Sunday Times this week a prominent piece about the death of author J G Farrell back in 1979, coupled with a mention that his 1970 novel Troubles had been long listed for the Lost Man Booker Prize, an award for novels written in 1970 that missed out on the opportunity to win a Booker Prize that year due to changes in the eligibility rules. 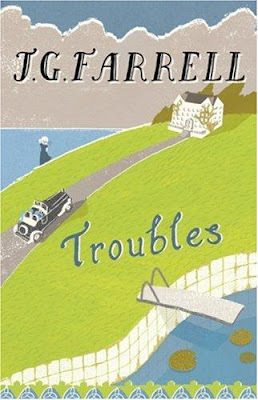 I only discovered Troubles a year or so ago, when it was recommended by a friend on the Flickr website, who said something along the lines of I would not believe who good this novel was. That's asking for trouble, of course, but the thing is...they was absolutely right! This is an absolutely superb novel, so full of detail and nuance that it requires several reads to appreciate it all. And don't be fooled by the mention of Booker prizes into thinking it's dry and stuffy in tone - it's written in a very lively and readable manner, with moments of humour on every page. If you do nothing else this year, I urge you to give this book a try! If you enjoy it (and why wouldn't you? ), then the good news is that there are two other major novels by Farrell to read, namely, The Singapore Grip and The Siege of Krishnapur. There's also a few 'minor' novels worth a look, the best of which is A Girl in the Head. Major Brendan Archer travels to Ireland - to the Majestic Hotel and to the fiancée he acquired on a rash afternoon’s leave three years ago. Despite her many letters, the lady herself proves elusive, and the Major’s engagement is short-lived. But he is unable to detach himself from the alluring discomforts of the crumbling hotel. Ensconced in the dim and shabby splendour of the Palm Court, surrounded by gently decaying old ladies and proliferating cats, the Major passes the summer. So hypnotic are the faded charms of the Majestic, the Major is almost unaware of the gathering storm. But this is Ireland in 1919 - and the struggle for independence is about to explode with brutal force. J G Farrell was born in Liverpool in January 1935. In 1956 he went to study at Brasenose College, Oxford; it was while there he contracted polio. He drew heavily on his experience for his second novel, The Lung (1965). His novel, Troubles (1970), the first in the Empire trilogy, won the Faber Memorial Prize in 1971. A film version of Troubles was made for British television in 1988. The second in the Empire trilogy, The Siege of Krishnapur (1973) won the Booker Prize. J G Farrell died in 1979 at the age of 44, after drowning whilst fishing at his home in Ireland.